If you have Auston Matthews in your hockey pool, you’re probably a pretty happy camper right now. The Toronto Maple Leafs forward had four goals in his debut on Wednesday night as his team faced off against the Ottawa Senators. And while the Senators picked up the overtime win thanks to Kyle Turris’ second goal of the game, the Maple Leafs have got to like how their star looked in his first NHL game. 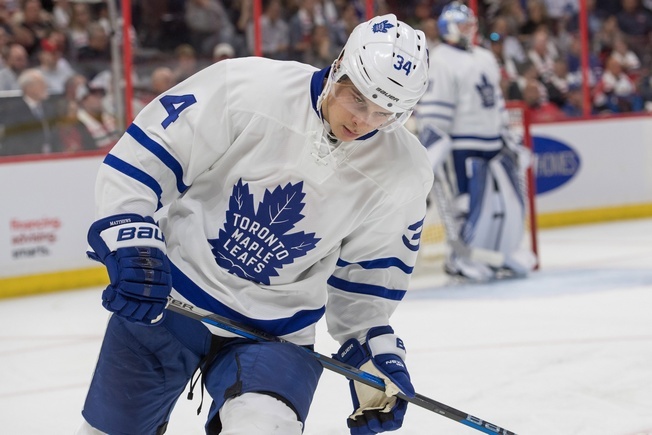 Matthews had all four Toronto goals in the 5-4 loss. He registered six shots on goal in 17:37 of ice time, 3:41 of which was on the power play. 20-year-old William Nylander, another key piece to the Maple Leafs’ future plans, had two assists and three shots on goals. Matthews scored his first goal at 8:21 of the first period. He followed up six minutes later and put the lid on a hat trick late in the second period. At that moment, he became the first number one draft pick to score three goals in his debut. But because that wasn’t enough, Matthews added a fourth goal and became the first player to ever do so in his debut in the modern era. The last top pick to score a single goal in his NHL debut was Ryan Nugent-Hopkins, who did so with the Edmonton Oilers in 2011. In all the history-making awesomeness, it’s important to remember that Toronto still lost the game. And perhaps that speaks to their luck as a franchise, as they can post one of the most astonishing NHL debuts of all time and squeeze four goals out of a top draft pick only to still find a way to lose the game. Bobby Ryan, Erik Karlsson, Derick Brassard, and Turris had goals for the Senators. Toronto outshot Ottawa 38-30. Both teams were unable to convert on the power play and the Senators played a more physical, defensive game.